Below is a list of the top ten surnames in Derry city. If your ancestor was a Doherty or a McLaughlin residing in the city in the nineteenth century then the challenge is enormous even in the period after civil registration (1864) because there will be many entries in each year for that surname in the birth, marriage and death entries. Indeed such are the complexities of such research that it would require the help of a professional genealogist. Interestingly, many of the surnames in the list resonate in Donegal since Derry grew rapidly in the 19th century attracting migrant workers from the rural hinterlands particularly in the post-famine period. Family research is a labour intensive activity because of the nature of the records. Births, marriages and death certificates are the building blocks of the tree but even they contain relatively limited information in Ireland. Death certificates give limited information on the deceased name, age, marital status, occupation and cause of death - usually though, the informant was a relation and sometimes the relationship was specified by the registrar. Marriage certificates give the name and occupation of the father of both spouses. Birth certificates are the most useful since they identify the father and the mother with her maiden surname. Nevertheless, the certificates themselves need to be carefully analysed and dissected - note occupations, addresses, witnesses and informants as these all provide additional clues and supporting evidence for future research. In the period before civil registration research becomes more difficult as there are no systematic set of records. 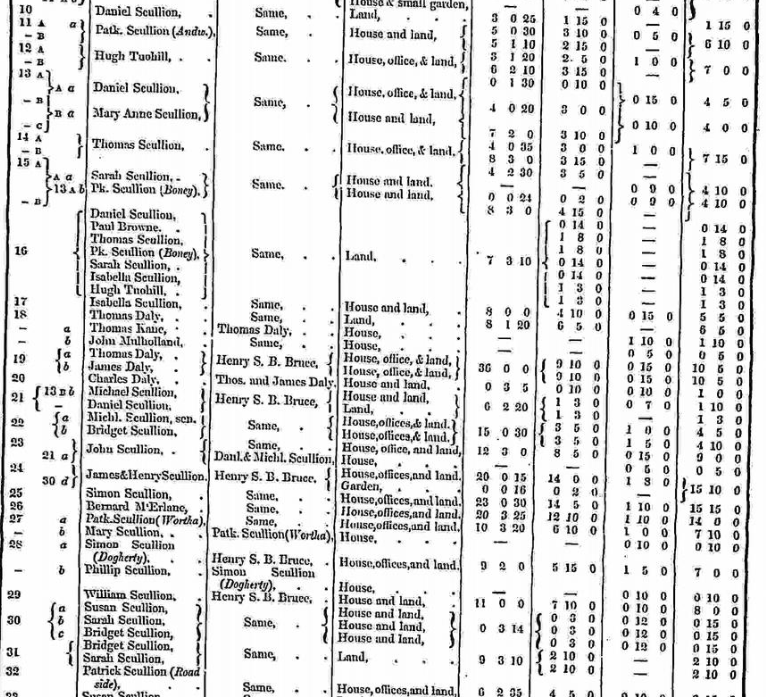 One would be relying on church records where they exist, land records and valuation records such as Griffith's primary valuation of the mid-nineteenth century. 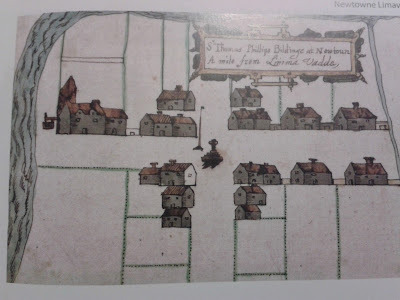 The key to research before civil registration is the identification of place of origin especially the townland and parish. There are certain areas where surnames are dense in a particular location. Doherty in Derry city, McLaughlin in Inishowen, Mullan in Limavady, McGuckin/McGuigan in Ballinascreen, Scullion in Ballyscullion, McGlone in Lissan and so on. Often in these regions families had nick-names to distinguish between the different sets of families. 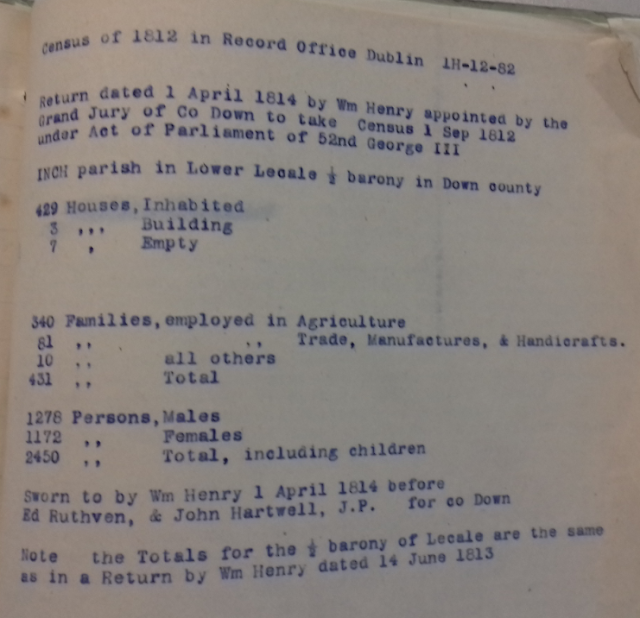 In the Griffiths' books for Ballyscullion the surname Scullion was so common that the enumerator distinguished the families sometimes with an agnomen. Usually, this was patronymic or a nickname - examples for Scullion include Andrew, Boney, Wortha, Dogherty, Roadside, Carman, Jack, and Butish. Whilst some of these Scullion families may have held onto these nicknames many are probably lost to the mists of time. Occasionally in Griffiths' valuation books the father's name is placed in brackets after the name of the occupier and this is a most useful feature of this source. 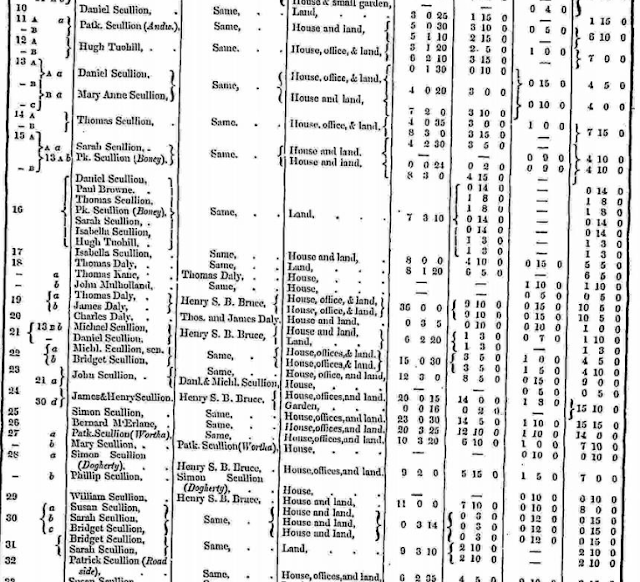 Griffith's valuation is much more than a list of names and is one of the most useful tools for identifying the exact location where ancestors resided (as there are accompanying maps). With common surnames the workload is enormous since one has to separate the various strands of families with the same surname and even christian name. One might be fortunate if an ancestor used a rare christian name and this can be and identifying marker for your family. There is no doubt, however, that James, John and William were the most common christian names used before 1900 in Ulster. 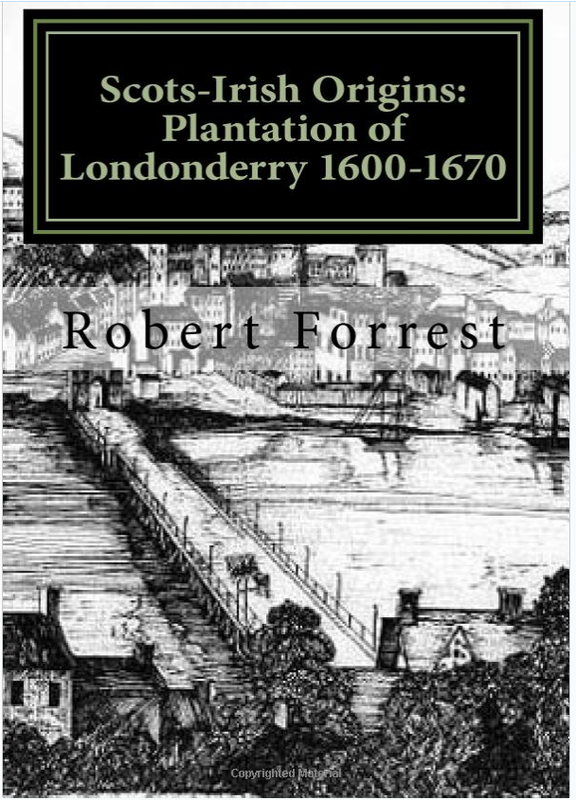 This again creates a problem if you ancestor was a John Doherty or a John McLaughlin residing in Derry then there will be many individuals of that name in each year of civil births, marriages and deaths. There are many forums on the internet where people of common interest seek out information about their ancestors often with the false hope of finding additional information from someone else. For those with common surnames such hope is misplaced. One will not find a family tree on the internet unless someone has already researched the family and the chances of that are incredibly slim. One could post for many years and not get any further with family history. In order to succeed in family history one has to do the research in the records or employ someone to do it. Otherwise, it will prove to be a fruitless and frustrating past time. 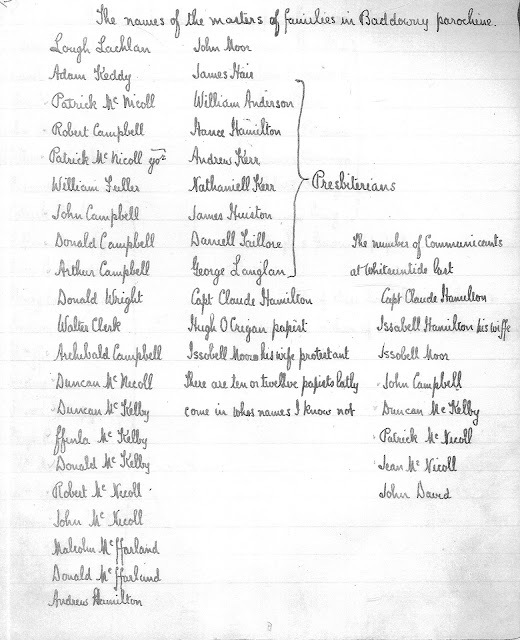 Portion of the Griffith's Valuation primary fieldbook for Ballyscullion West where the Scullion surname was common.